If you have needs beyond the normal purchase options of the website..
We work with large corporations, franchises and distributors on many different levels and are happy to accomodate your needs. We have a multitude of ways to work together. Want to Purchase the units outright? Want to Lease them so you can write it off on your taxes and get upgrades when available? You tell us how you want it! 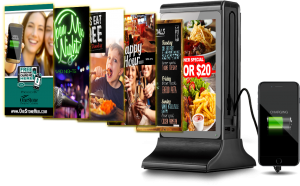 Our Wifi, LCD & Backlit Units are available for Purchase or Lease in a multitude of ways to fit your needs. 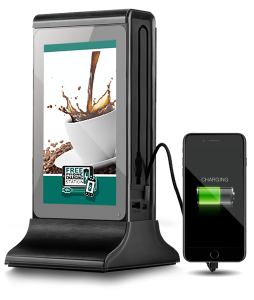 You can offer FREE Charging to your customers while you increase sales, advertise your offers and even write off your lease! You control the advertising for your own offers and change the campaigns as often as you like! Take advantage of significant savings with our Discounted Marketing Program where you get the benefits of offering FREE Charging to your customers while OneStone manages the ad space. You control a portion of the Ad Spaces of the advertising for your own offers and benefit while OneStone manages additional advertisers that do not conflict with your establishment’s products or services. Please let us know which product suits your needs and we will be happy to set you up with the best solution for your advertising and charging needs!